Coffee Trail - Counting Stars, Reaching Delphi .✫*ﾟ･ﾟ｡.★.*｡･ﾟ✫*. : Seriously, it was caramel, wasn't it? The first night in Singapore city and at the Star Performing Arts Centre, hopping on and off buses and uber-rides made us feel like serious tourists on a fast-paced sight-seeing mission. By the time we finally dozed off that night, it was almost after three. Yaay, we almost reached the record that we had set in Lang Tengah Island a couple years earlier. The second day promised us nothing less. With hungry tummies and caffeine deprived pulses we headed to Penang Road in the Orchard district to Devil’s next recommendation. 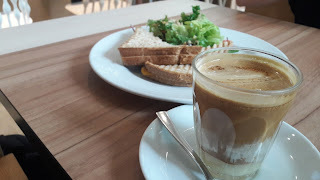 It was a charming boutique cafe. On the way, we received a text message from Muthu, an old friend who is also working in Singapore now. He was supposed to have joined us for coffee but couldn’t make it that morning due to a personal matter. We were disappointed, the three of us were office colleagues many moons ago. But the dentist is not someone a little girl, Muthu’s daughter, would want to visit if she had a choice. At the cafe, after a brief parking-lot syndrome and a five-minute intense discussion, we agreed to be seated indoors. Devil was not too pleased, but I got the guest-privilege to decide this round. This place, which I choose not to name, is well respected for its food and for its signature coffee. Or for its Kopi rather. It is a smooth, silky textured espresso with creamer. The flavour had a hint of caramel or fruit, perhaps even a honey extract. I asked the store manager to reconfirm my observation; her reply was not convincing. Nothing is added besides the espresso, she said. So, I decided to go with my taste bud’s observation. If you are into flat-white styled coffee, this is something worth trying mainly for its twist. The price is upper middle range. Its customers were primarily from the Singapore expat group, with a few visitors like Devil and me & a couple of locals. The ambience and the presentation were perfect. Its location hidden but not too difficult to find within the city, making it ideal for a cosy cup of coffee. I learnt there are a couple more of its branches across the island. Devil spent a good amount of time organising this fun-packed 24-hour trip for me. Being the warm and perfectionist person, she is, I suggested she takes up coach-surfing. She raised an eye-brow giving me ‘an I’ll-think-about-it look.’ I see a good freelancer in the making. 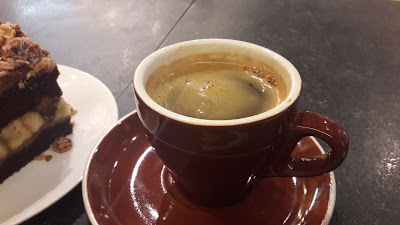 Our parting coffee at Novena Square was a simple old-timer on the block, the Americano, not so local, but it served its purpose. If Americano is calling, there is hope for Delphi. Sweet, that was a nice weekend!